Schatzalp - enchanting holidays on the Magic Mountain. Set amid Switzerland’s largest hotel gardens, Berghotel Schatzalp is situated high above Davos in an area of 470,000 m² that offers relaxation, peace and pleasure. Enjoy the breathtaking view across the Grisons mountains! Whether skiing in the “Slow Mountain Skiing Area”, hiking, tobogganing on either the summer or winter toboggan run or paying a visit to the Alpine flower garden Alpinum Schatzalp - there’s something to suit everyone. The Schatzalp cable car takes you to us in just four minutes directly from the centre of Davos Platz. Thomas Mann's magic mountain, the Schatzalp, lies in the heart of the Grisons mountains, 300 metres above Davos and only 4 minutes to reach by cable car from the town centre. Here you will find the botanical garden "Alpinum Schatzalp" which was founded in 1907. 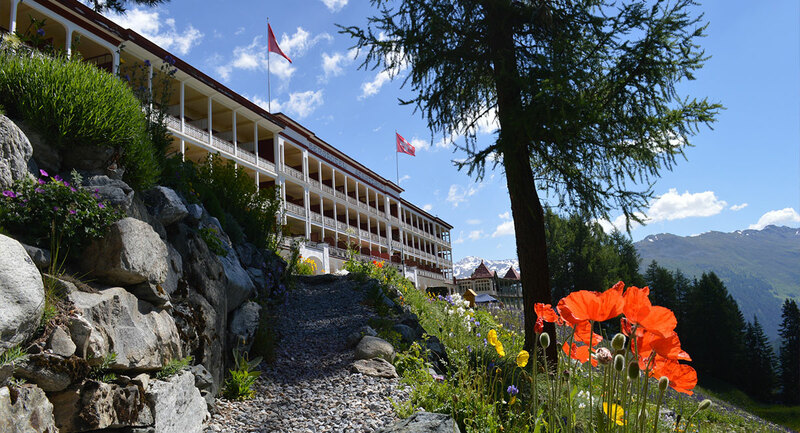 (2017 = 110th anniversary) and is the largest hotel garden in Switzerland, with a size of 450 000 m2. Originally it served the guests of the Schatzalp sanatorium distraction and occupation (1900 - 1954), however today it is one of the most exciting hotel gardens in the world. At almost 2000 metres above sea level you will find a breathtaking collection of approx. 5000 species and varieties of different plants from all parts of the world. From mid-June, to the end of October there are new highlights to discover every day. Among other things, the largest Edelweiss collection of the world, over 400 different gentian, 200 different Bellflowers and other rare plant collections such as wild flowers - peonies, iris and larkspur and many rare plant specialities from Tibet, the Caucasus and our Alps. A special highlight is the large kitchen herb collection right in front of the hotel. The collection is not only an optical experience, all the herbs the garden produces allow the chefs of the 5 restorations on the Schatzalp to spoil their guests with culinary delights.